O, Cannabis! Craft marijuana co-ops in the Valley? O, Cannabis! Craft marijuana co-ops in the Valley? O, Cannabis! Craft marijuana co-ops in the Valley? Home » Articles » O, Cannabis! Craft marijuana co-ops in the Valley? Photo by Marty Dagoberto. A workshop in December 2017 co-hosted by NOFA Mass called "Cannabis on the farm." Photo by Eric Schwartz. 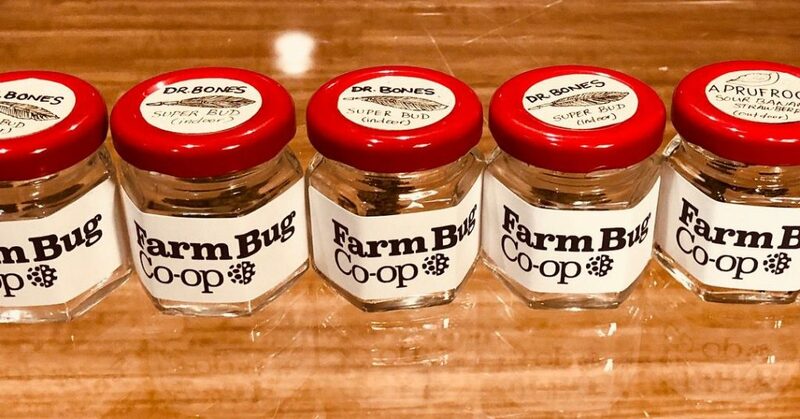 A row of jars holding different strains of dried cannabis from Farm Bug Co-op. Photo from Eric Schwartz. 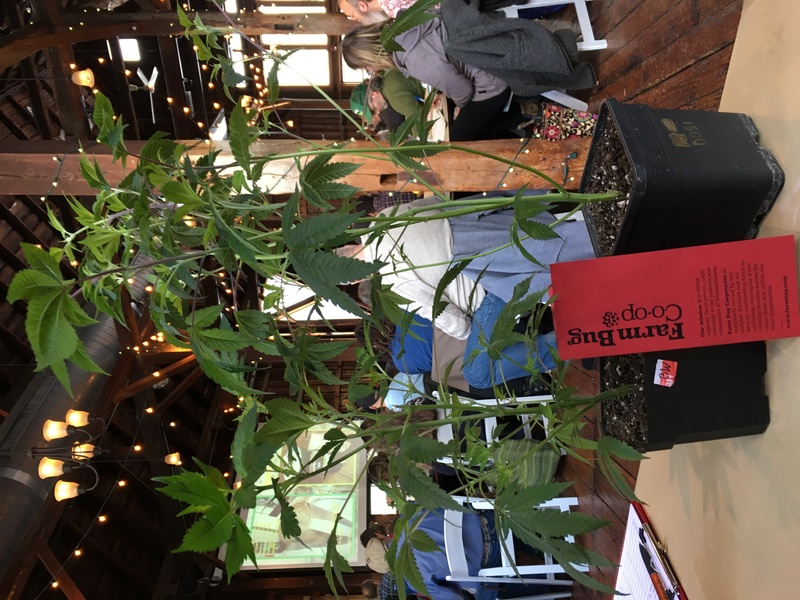 A cannabis plant grown on a farm that might be part of the Farm Bug Co-op at a NOFA Mass workshop in December. The Pioneer Valley has a rich agricultural history and is home to many famous products, including “Hadley grass” (asparagus grown in Hadley) and enough tobacco in the 1800s for the region to be known as the “tobacco valley.” The Valley now has the opportunity to take advantage of growing a different kind of grass: cannabis. Will cannabis be the next craft product making a name for itself as a high-quality, Valley-grown product? Local growers and cannabis activists are teaming up under the umbrella of “craft marijuana cooperatives,” which is a licensing category included in the final set of regulations that were voted on by the Cannabis Control Commission (CCC), to ensure that it is. “I really fell in love with the co-op idea because of the notion of creativity,” said Eric Schwartz. 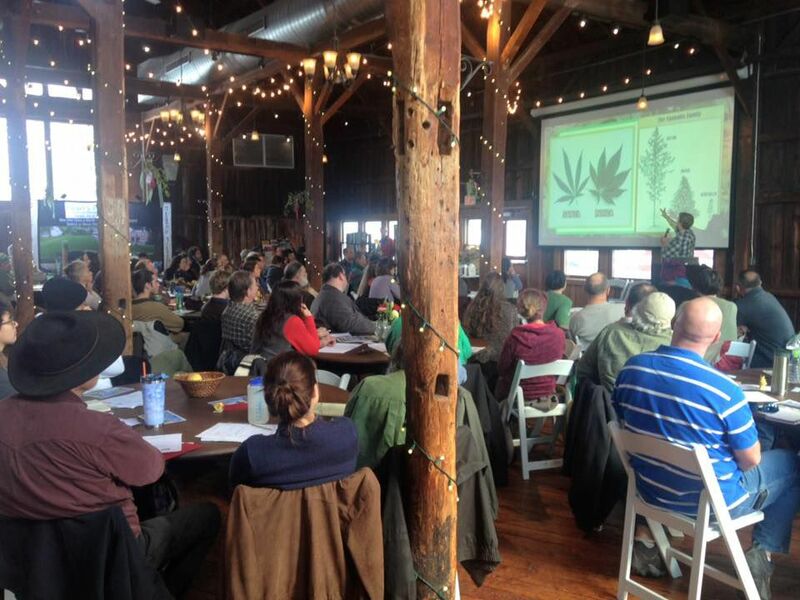 Schwartz is a Somerville-based digital marketer and co-founder of Farm Bug Co-op, a cultivator cooperative that could have members growing cannabis all over the state, including in Western Mass, once it obtains a license. Schwartz plans on using his marketing skills and passion as a cannabis activist to bring farmers together to grow cannabis under the Farm Bug Co-op name, and his activism has already paid off for farmers. Schwartz spent a lot of the last few months meeting with cultivators and attending public hearing sessions with the CCC members to advocate for three primary changes to the draft regulations: first, that the term “cooperative” be defined based on existing cooperative principles, second that the cap on the number of locations allowed under the co-op license be removed, and third that security requirements on cultivators be assessed on a case-by-case basis. Schwartz said that he feels confident that the changes he was advocating for were well received by the CCC. Marty Dagoberto, the policy director at NOFA Mass (the Massachusetts branch of the Northeast Organic Farming Association) explained that the changes will help even more small farmers to benefit from the cannabis industry. Defining cannabis cultivating cooperatives by the seven cooperative principles ensures voluntary, open ownership, democratic owner control, owner economic participation, autonomy and independence, education, training, and information, cooperation among cooperatives, and concern for the community. Dagaberto said that NOFA Mass might even consider developing a clean cannabis certification that could help consumers to know that the cannabis they are buying was produced locally and sustainably. Mike Lupario, 22, a senior at UMass Amherst studying Environmental Science, is one grower who is contemplating growing cannabis in the Valley under the Farm Bug Co-op licence. Lupario recently acquired land in Hadley where he is growing some medicinal herbs, like echinacea and saint john’s wort, and working to improve the quality of the soil. While his priority is to grow other sustainable crops, Lupario believes that growing cannabis could be a great way to keep the industrializing cannabis industry sustainable. After legalizing adult-use cannabis in 2016, California quickly saw much of its marijuana farming turn industrial, which often means bigger farms only growing one crop. The co-op license will function similarly to how other farm co-ops already do. For instance, in Massachusetts there is a milk co-op called Our Family Farms that was created to help keep family dairy farms afloat by marketing together under one brand. 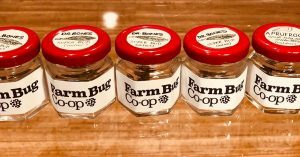 Schwartz explained that a co-op like Farm Bug will allow many different farmers to grow cannabis either in their fields or in their greenhouses and then market collectively (which is why expanding the license to more than six plots is important to activists). Collective marketing helps farmers to save money and gain brand recognition while still maintaining independence and creativity on their own land, which Schwartz hopes will then result in more diverse strains. “Hopefully, the more we can make this a small local business thing the more it can help the patient or consumer,” Schwartz said. While many farmers and activists agree that the craft marijuana cooperative license is a great way for cultivators to join the cannabis industry in Massachusetts, there are still a few problems. The earliest that a cannabis license for recreational sale or cultivation can be issued is June 1, which is a problem for cultivators. Cannabis plants need to be started by seed in February to be planted outside during the traditional growing season. Even if growers used clones once licenses are issued, there likely won’t be a cannabis crop available from growers who aren’t already growing medicinal cannabis until October. “Initially, I think you’re going to see a problem with supply and demand,” said Peter Bernard, executive director of the Massachusetts Grower Advocacy Council. Last July, Nevada ran out of legal cannabis two weekends after they allowed adult-only recreational sales. In 2014, Washington ran out in a matter of days. Luckily, the CCC was the first in the country to protect medical cannabis users by requiring that dispensaries reserve a certain percentage of their inventory for medical cannabis patients. But that doesn’t help retail shops who might want to open in the summer for tourists. “I wouldn’t open up my shop right away,” Bernard said. Another roadblock for some growers is that many towns across the state have placed moratoriums on any cannabis businesses, including in Hadley where Lupario will have to wait until the fall to petition the town to hold a vote to lift the moratorium. 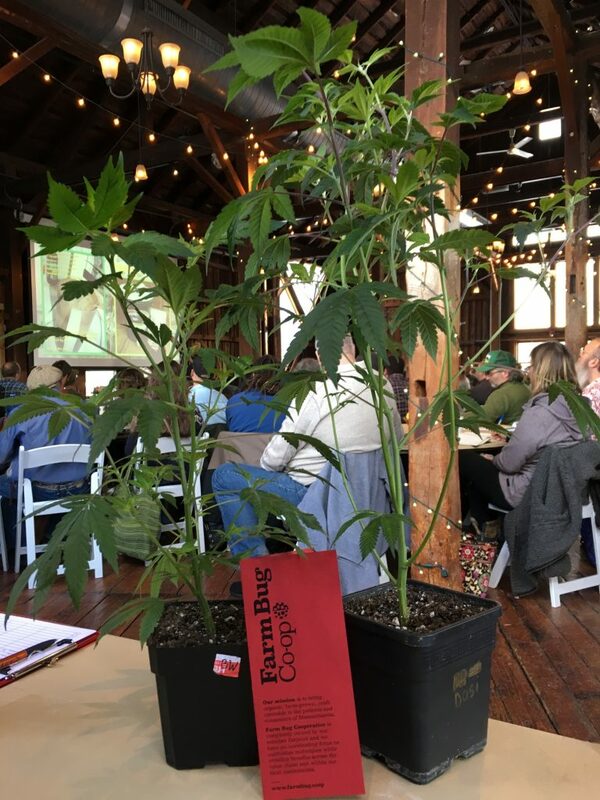 Despite these setbacks, Schwartz and the other activists maintain a positive outlook on the future of craft marijuana cooperatives and hope that other farmers come out of the woodwork.